Baby Dane, at one week old. You have at least one thing in common with everyone alive today, and indeed with anyone who's ever walked the earth: You were born. For the vast majority of us, the details of that universality are all but irrelevant. Occasionally our parents might recount the complicated deliveries that accompanied our arrival, but it's not always easy to appreciate the intensity of those events in light of the seemingly more important outcome — that is, the simple fact of our existence. Yet that mind-set shifts when we find ourselves on the giving rather than the receiving end of the generational divide. Suddenly those protracted labors, emergency Caesareans and preterm births seem like imminent possibilities. And this despite hard figures from the National Vital Statistics System that, for example, America's preterm birth rate has been falling steadily (as of 2010, it was under 12 percent), the need for vacuum or forceps during vaginal deliveries has plummeted (it now sits comfortably below 5 and 1 percent, respectively) and infant mortality rates are a fraction of what they were even 50 years ago (25 per 1,000 births in 1960-65, down to just five per 1,000 between 2005 and 2010). There are, however, less rosy figures to contend with. Between 1990 and 2013, the number of maternal deaths per 100,000 live births (called the maternal mortality ratio, or MMR) in the United States rose from 12.4 to 18.5, according to a just-published study in The Lancet. To group the countries that have seen an increase in the MMR in the past decade means putting the United States in the same company as El Salvador, Afghanistan and South Sudan. A 2011 article in Contraception magazine notes that critical childbirth situations in which the mother's life was in jeopardy rose by 27 percent between 1998 and 2005 in the U.S. to affect 34,000 women per year. All these statistics notwithstanding, apprehension toward childbirth is both understandable and natural. It is a major life change for women as well as men, one that brings new responsibilities, new routines, and reevaluations of our selves and our relationships. "There's all these unknowns," says Tine Reese, who founded the popular childbirth resource network Bloom Spokane. "Can I do it? How do I make these decisions for myself, for my spouse, for this new being? What if a home birth needs to transition to a hospital? What if an otherwise routine pregnancy turns into a Caesarean?" Some of these doubts and concerns have existed for millennia. "[T]he act of birth is the first experience of anxiety," Sigmund Freud theorized in a tokophobic footnote to The Interpretation of Dreams, "and thus the source and prototype of the affect of anxiety." (Yes, there's a word for fear of childbirth and pregnancy: tokophobia.) Others, somewhat paradoxically, have arisen despite — or because of — the increasing sophistication of health care. In the 25 years she's been providing childbirth instruction in England and the U.S., Clair Bennett reckons she has never seen a level of anxiety regarding childbirth greater than the current one. "I'm stunned how fearful women are," she says. "I have never come across such a generation of women who seem to lack such confidence in their bodies at being able to birth their child. I would have thought that over the decades, with the enlightenment and education, that women would be less scared." The basis for those fears isn't easy to pinpoint, given what a charged event childbirth inherently is, but Bennett has her suspicions. "I put a lot of it down to Hollywood, because when you watch the depiction of birth in TV and the movies, it would scare me," she says. The life-threatening rush to surgery isn't the only depiction that the visual media offer, but the alternative nevertheless tends toward another extreme: a stylized, sanitized version of birth, such as the impossibly glamorous arrival of Prince George last year. 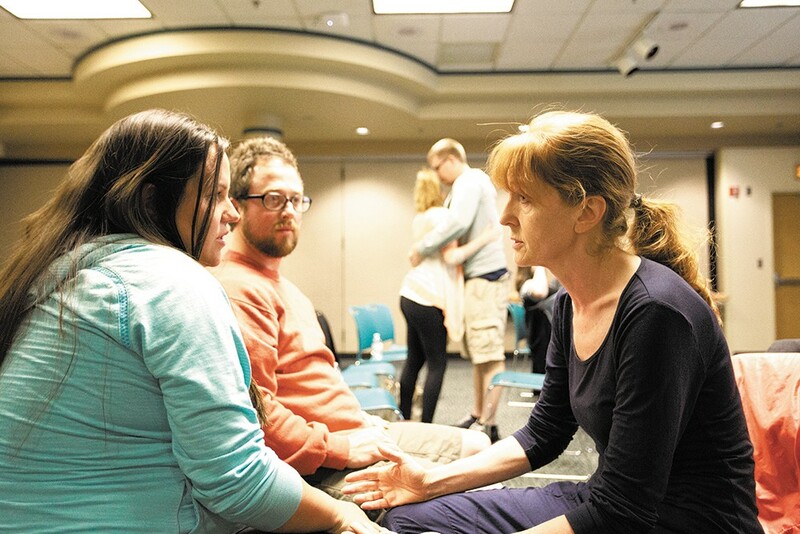 Clair Bennett counsels Amy Evans and Brian Rickey during a Childbirth Education Class. Certified doula Xylina Weaver agrees, citing Laboring Under an Illusion, a 2009 documentary by Vicki Elson that explored the disparity between on-screen births and the reality: "Today our only experience and awareness of birth, especially if you're among the first of your group to have kids, is media birth. It's an engaging, interesting, exciting, maybe funny birth, but it's not real birth." For Weaver and Reese, the widespread distortions of media birth are an important but tiny part of why parents, especially first-timers, might be more apprehensive regarding childbirth than in the past. This larger issue is also cultural in origin, but is more institutional than representational in its manifestation. Childbirth is "a process of ... letting go, and in that vulnerable state you want to be able to wholeheartedly trust your care provider," says Reese. "That [trust] doesn't exist, because people know that doctors and hospitals are doing interventions because they can make money. And this is across the whole health care system, not just in maternity care. "A labor and delivery nurse I talked to this morning said almost every time a doctor makes a recommendation to one of her patients in labor for an intervention of some sort, the second that doctor leaves the room, they turn to her and say, 'What do you think?' They want a second opinion from the nurse or from their doula." "Your average face time with most doctors is only five, six minutes," Weaver adds. "How can you have a relationship with this person? There isn't a lot of time for confidence-building and for having a rapport." If basic interpersonal trust seems like a bygone, so too are the days that pregnancy preparation consisted of a well-thumbed, secondhand copy of What to Expect When You're Expecting. Not only is a glut of information on childbirth out there, it's instantly accessible through our TVs, magazines, and any device capable of connecting to the web. In theory, this ubiquitous, unlimited access to firsthand experiences and unfiltered advice should do more to assuage our fears than stoke them, but that's not often the case. At the mention of the Internet, Bennett rolls her eyes and groans. "If you have an issue, don't Google it!" She recalls one participant raising her hand to confirm a blogosphere account of an epidural that "went the wrong way," causing the patient's head to go numb instead. If there's an upside to be found there, it's that it provided a good starting point to address the many misconceptions that are passed off online as fact. "On the Internet," Reese says, "stories either tend to be horrible outcomes or, 'I had no pain, it was beautiful, in a candlelit setting.' Guess what? For 99 percent of us, our births are somewhere in the middle." Social media, adds Weaver, merely compounds the issue by adding old-fashioned gossip to urban myths. "With our access to personal information, you know who's cloth-diapering and who's using disposables, who vaccinates and who doesn't, who's formula-feeding and who's breastfeeding. I tell my classes: 'You will be judged.' By in-laws, by friends. There's no right thing to choose so that nobody will judge you. But that means you are the one who gets to decide what you want to do for your family. "We have to move away from looking outwardly. We have to be confident in our own decisions. It's not for Facebook to decide." For their first and second pregnancies, Dave Musser and his wife Bri did consult the Internet. They even followed some advice that makes them laugh in retrospect. They took classes, too, and spoke with their large circle of friends and family. And still he admits to being "very ill-prepared and just scared to death" when it came to their firstborn. "You have no idea how a birth's going to go, even though they tell you in the classes. We knew that it was going to be life-changing, that all our routines were going to be ruined," he says. But as far as the birth itself was concerned, they were pleasantly surprised. "Our first was amazing. We got to the hospital at 10:30 and the baby was born by 12:45." It was almost too easy. "When we left the hospital it was like: 'What? We just walk out with this?' It was harder for us to get a car than a baby," he laughs. "For the car we had to sign all this paperwork and we were there forever. The hospital just signed us out and said, 'See ya!'" Doula Xylina Weaver (left) admires Tiffany Long's 12-day-old daughter Olivia at Spokane Midwives. With their second child, born this April, both the birth and the postpartum period have proven unexpectedly challenging, despite the old (and clearly erroneous) chestnut that everything comes easier after the first. The baby was stubbornly breech, which required a scheduled Caesarean. In the weeks that have followed, he's had difficulty feeding and has struggled to regain his birthweight. "My wife does have this picture in her head: how giving birth, how breastfeeding, is going to look. She wants it to be a certain way, because that's how it's supposed to work, right? "I think Bri feels like she's failed," he says, "because she's trying really hard, and she's doing everything, and then he's just not eating. And it's kind of the same with the C-section, too. She was very scared, and it was a hard pill to swallow. She didn't want to have to go through a surgery. Maybe it's just me being insecure, but it feels like we're being judged by people: 'You're doing it wrong.'" Musser, however, is resolutely upbeat. True to his calling as a part-time pastor and "spiritual architect," a job title he proffers with a cheeky grin, he says they've come to regard the challenge as an opportunity for growth: "One thing Bri and I are going to take from this is that we're not going to give advice to people unless asked. And we're not going to show judgment towards people who have different ways of parenting. We're all experimenting and learning as we go." That same open-minded, inclusive philosophy is one stressed by Bloom Spokane, as well as Bennett and her colleagues at Providence Health & Services. "It's not my job to tell anyone how to give birth," Bennett says. "It's my job to give them all the choices so they can make an informed choice. Because even if everything doesn't go according to plan, at least they're familiar with the options they're being given." Her phrasing — according to plan — is worth highlighting. When discussing childbirth eventualities, it's easy to fall into the trap of saying, "When things go wrong." Yet that not only exacerbates fears, but also implies there's a right way to give birth. What's more, this idea of deviating from a plan also speaks to the very contemporary notion of being able to manage and arrange every milestone in our lives. Megan Kennedy and her husband Rob are unabashed planners. They have to be. In operating Rogue Heart Media — a video production and photography company that specializes, coincidentally, in documenting life milestones — out of their home, they have to schedule assiduously to maintain a suitable work/life balance. "I feel like I did everything I could to not be fearful, whether it was the books I was reading or the people I was confiding in," Megan says, describing her pregnancy with Dane, their first child, born this past February. "I actually took a Tibetan meditation course, trying to gain some additional skills on mental strength and focus. That made a huge difference in my pain management." She and Rob opted for a home birth for several reasons. One was the "pragmatic" concern over cost. "Because [the hospital] billed in three different sections — at the beginning, the middle and the end — it would have meant meeting our deductible twice in full." Another was her mother's disconcerting experience with Caesarean section, which had been necessary to birth Megan and her twin sister. Another was the "impactful" 2008 documentary The Business of Being Born. Finally, "the whole hospital environment seemed very uncomfortable. I was worried that [my labor] would be drawn out if I were in a stressed state of mind." Despite her best-laid plans, Kennedy's labor proved to be anything but quick. Contractions began early on a Monday morning and continued without progress until Wednesday evening. By the time they hit the 60-hour mark, the attending midwife, doula and family members calmly informed her that they'd decided to transfer her to a hospital. Roughly eight hours and one epidural later, their baby finally was born. Throughout it all, despite her physical exhaustion, Kennedy says she generally felt at ease with things, if not exactly wholly in control of the situation, thanks to her close-knit support group and her advance preparation. "All in all, the part that I was most nervous about, more than the labor, was what it would be like to have a newborn in the house. I'd never been around babies that much. They always looked so fragile, and I hardly had any exposure to holding them. But everyone says it's different when you have your own, and it's true. I couldn't believe how easily Dane assimilated. It's two months and we're like, how did we ever live without you?" Kennedy admits that the adjustment, though smoother than anticipated, has prompted them to rethink their plans for a large family. "It's mostly just how big of an impact it is on life. We already have our hands full with one, and are having a hard time imagining what two would be like," she says, while acknowledging that they felt an added personal and professional obligation to resume work quickly.